As surely as The Wizard of Oz hits the cable channels each October, Willy Wonka and the Chocolate Factory plays every Christmas season. As a child, I liked the trippy 1971 film but as an adult I like the timeless movie even more. Watching Wonka last night, I’ve come to love Gene Wilder’s mocking nerve, and appreciate the zingers aimed at overindulged children and their pathetic parents. And I have finally have caught the shower of literary references. The classic film is sprinkled with great words from Ogden Nash, William Shakespeare, Oscar Wilde, Arthur O'Shaughnessy, John Keats, and Lewis Carroll. Proving that words really do produce ripples of influence, Willy Wonka is peppered with poetry from the past. 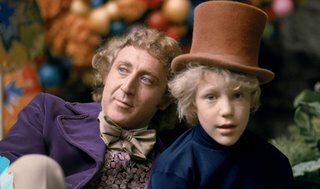 In turn, Wonka went on to influence scores of new artists. Willy Wonka: "The strawberries taste like strawberries. The snozzberries taste like snozzberries." Veruca Salt: "Snozzberries? Who ever heard of a snozzberry?" Ode – once experienced in Willy Wonka -- went on to inspire countless creatives. The first two lines have been used as an album title for Joy Electric, and for a track by Aphex Twin. A New York band even dubbed itself We Are the Music Makers. The O'Shaughnessy poem comes from the collection Music and Moonlight, published in 1874. Ode is often quoted, but rarely provided in its entirety.